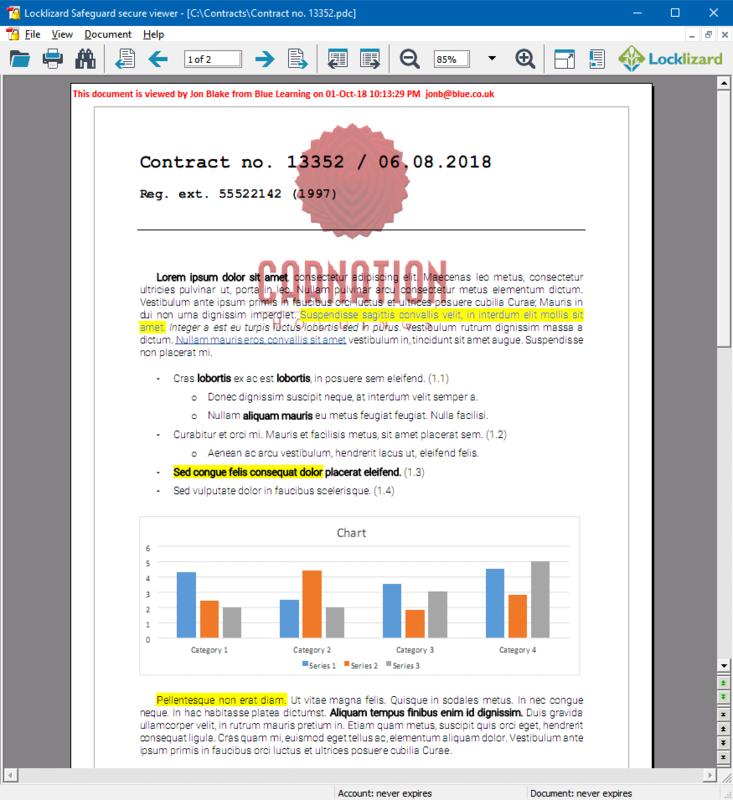 Adding watermarks to PDF files with Safeguard is very simple. Right-click on your PDFs in Windows File Explorer and select the menu option ‘Make Secure PDF’ to invoke Safeguard Secure PDF Writer. Go the View or Print Watermarks Tab depending on whether you want PDF watermarks displayed on viewed and/or printed documents. 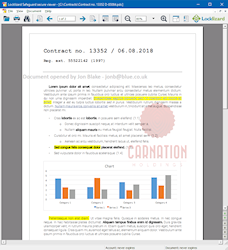 You can select different watermarks for both viewed (View Watermarks) and printed (Print Watermarks) documents as you may want to apply different text/images to viewed and printed content. You would only want to add a print watermark if you allow printing. From the Text Watermark tab add the text watermark that you would like to be displayed. To add dynamic variables press the button and select the variables you want to add. These variables will be replaced with actual data when the document is viewed/printed. You can change the font, opacity, where the watermark is placed on the page (position), and whether the watermark is displayed on top of or behind PDF content. 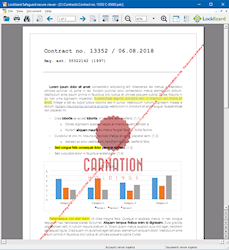 Displaying watermarks behind PDF content is less unobtrusive to the user yet still enables the document owner to clearly identify who the document originated from if it is unlawfully distributed. If your document or ebook consists of a cover page then you may want to check the ‘Don’t add watermark on first page’ checkbox so the visual effect is not spoilt by a watermark overlay. As well as text you can also add an image watermark to your documents. This may be for example a company logo. However, the main use of watermarks is the ability to identify a user if a document is being distributed unlawfully (e.g. a user has taken a photograph of a viewed document or a scanned in and distributed a printed one). What is a dynamic watermark? A dynamic watermark is a text watermark that uses variables or place holders that are replaced by user and/or system data when a PDF document is viewed and / or printed. You can add dynamic watermarks when protecting PDF files. The variables you select are replaced when the document is used (viewed/printed) with the appropriate details (i.e. the user’s name, email address, date/time of use, etc.). By using dynamic watermarks you only ever have to protect the document once – the correct user details are displayed as they are dynamically taken from the user’s license – rather than having to protect a document for each individual user with fixed watermark data. Why Safeguard PDF Watermarks over Adobe PDF Watermarks? 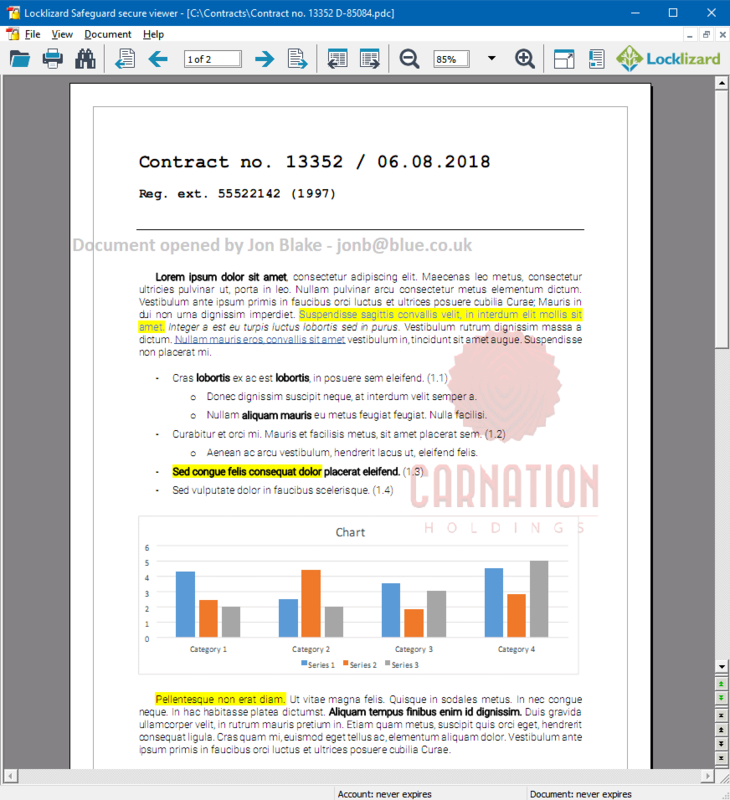 Using Safeguard to apply a PDF watermark has many advantages over Adobe Acrobat watermarks. Adobe PDF watermarks can easily be removed using simple techniques – see removing PDF watermarks. Safeguard PDF watermarks cannot be easily removed. There is no option to save PDFs without watermarks when viewing Safeguard protected PDF files, and third party PDF tools cannot remove Safeguard PDF watermarks. 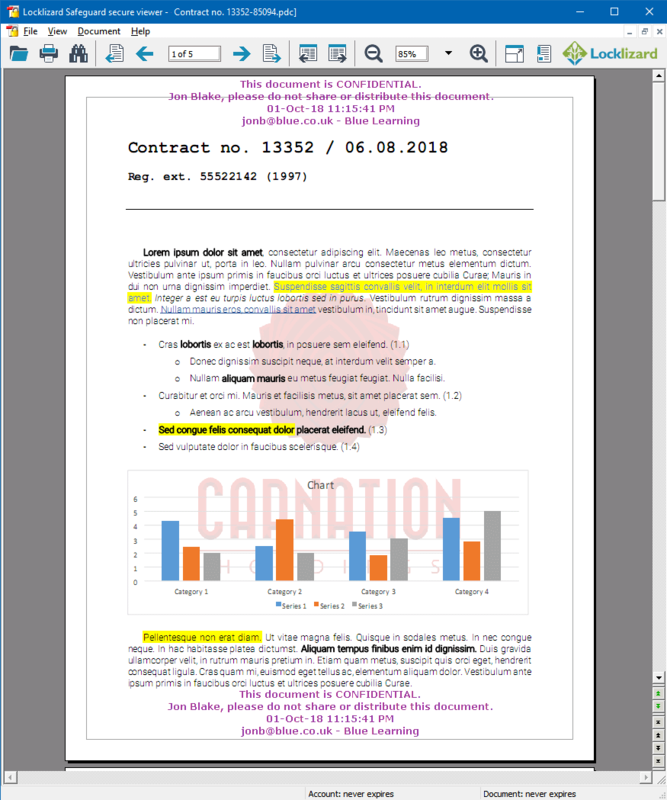 With dynamic PDF watermarks, user (name, email, etc.) and system information (date/time, etc.) is inserted at view and print time so you only have to protect the PDF once for all users – the appropriate user and system information is displayed accordingly. If you allow printing, a PDF print watermark with user information and system is essential in identifying the source of a PDF that has been printed, photocopied, and then distributed without authorization. Using Adobe PDF watermarks you have to protect the same PDF file each time for each user in order to customize the PDF watermark. You therefore might end up having to distribute thousands of the same PDF file in order to personalise it. There is no option to apply system information or a date/time stamp. 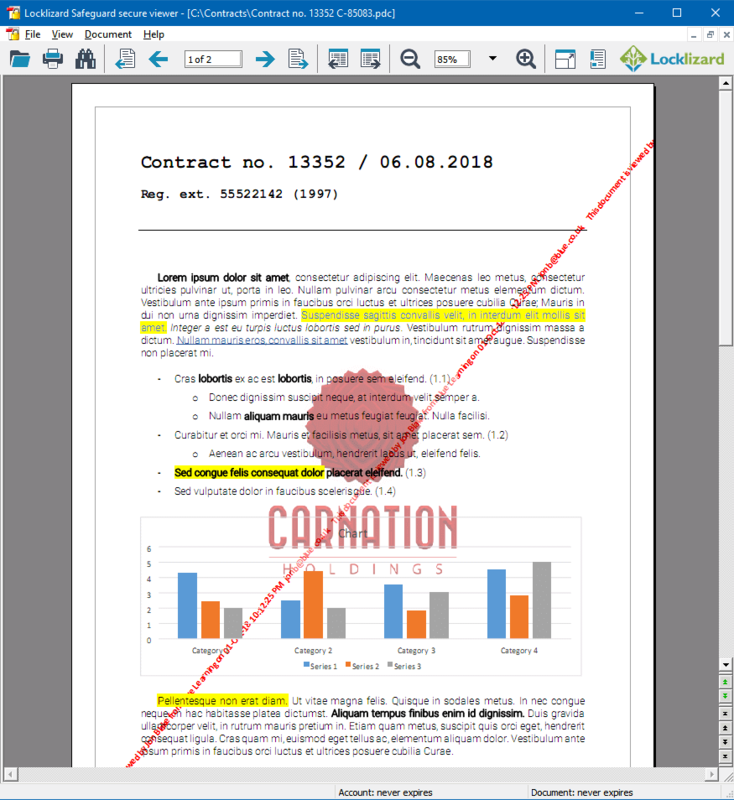 With Safeguard you can choose if PDF watermarks are displayed when documents are viewed or just when printed, or both. You can choose a different watermark for each and a different page position, colour, font, etc. for each type of watermark. You can even choose to repeat the watermark all across the page. With Adobe Acrobat, the watermark is inserted into the PDF and the same watermark is shown when the PDF is both viewed and printed – you cannot have different watermarks for viewed and printed pages. One way to improve the security of your PDF documents is to add PDF watermarking to them. PDF watermarks can be used in two ways – to resist falsification, and to link the document with a specific authorised user. See Using Document Watermarks as a copying deterrent. PDF watermarking may use many of the subtleties of the physical world. If you think of a banknote, some watermarks seem inside the paper whilst others are on top. You can get something similar with PDF watermarks. Think of the information being printed as if it were in layers, rather like a sandwich. The content sits in the middle, and the PDF watermarking can be over, or under the content, or both. Also the PDF watermark can be set to be lighter or darker than the content. In this way PDF watermarking is able to ‘blend’ with the content so that it has a more seamless presentation. This can help the PDF watermark to be less visually distracting – unless, of course, you want it to be very much in your face. So applying PDF watermarking takes a certain amount of discipline and artistic judgement, it is not necessarily a mechanical process of having a ‘bog standard’ graphic and/or text and applying it to every document that goes out. 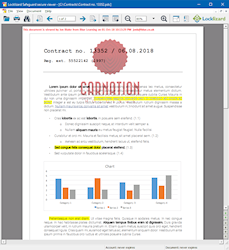 A standard PDF watermark may work very well when text documents are being sent, since their appearance is constant, but not so well if there are graphics or high resolution pictures as well. One other thing to keep in mind when using PDF watermarking is the length of the document being protected. It is impossible to prevent someone from using a graphics or picture editor from editing out the PDF watermark. But, the longer the document, the harder the task becomes. See removing PDF watermarks. Consider using text PDF watermarks that have a large font size, but are very ‘thin’. This means they do not upset the eye so much, but are much more difficult to remove without making the document difficult to read. This is particularly so if they go over the top of graphics. 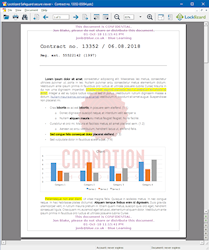 Short documents may need PDF watermarks that are graphics in order to occupy much more of the picture space making it more difficult to remove the PDF watermark, but possibly making the document more difficult to read. Do you need to identify who viewed and/or printed a PDF (and when) if unauthorized distribution has taken place? If yes, you need to look for a PDF watermarking solution that uses dynamic watermarks where user and system information is inserted at view/print time. Otherwise you will have to apply a custom watermark with individual user information to the same PDF file hundreds of times if you are distributing it to hundreds of users. Do you want to apply different PDF watermarks depending on whether the user has viewed or has printed the document? If so, the application you use to apply PDF watermarks needs to support this. So if you want to apply PDF watermarks to your documents then there are many things to consider including whether they are dynamic and how easily they can be removed. If you want to apply a PDF watermark that cannot be easily removed then you need to use PDF DRM software that enforces controls over the document (such as preventing editing, screen grabbing, printing to PDF or image printers, etc.). Safeguard PDF Security and PDF Enterprise Security software ensure your PDF watermarks are enforced at all times. but the problem is is that Adobe PDF watermarks can be easily removed, even if the PDF file is password protected to prevent this. Below are some of the many ways you can remove watermarks from Adobe PDF files. If the PDF files are NOT password protected, open the PDF document in Adobe Acrobat 8, choose the option “Remove Watermark” and then re-save the document. If the PDF files are password protected, then use a PDF password remover program such as A-PDF Restrictions Remover. It costs $10 for the software, and once the PDF password is removed you can use the method above to remove the watermark. If you have access to the original source document (e.g. Word document) that was used for creating the Watermarked PDF, create a new PDF file minus the watermark. If you don’t have the original source document then you can use a PDF to Word convertor to convert the document to Word, manually remove the Watermark and then convert it back to PDF. Use Adobe Illustrator to open the PDF, select the watermark object, delete, resave as PDF. Use a third party PDF editor like Foxit PDF Editor to remove the watermark. Examples of secure non-removable PDF watermarks created by Safeguard PDF Security. Safeguard PDF security uses public key technology (transparent to the user) so there are no passwords that can be easily broken or passed on to other users. You can dynamically insert usernames, email addresses, and date and time information into your PDF watermarks, yet you only ever have to protect the PDF once for all users. Document watermarks can be displayed when the PDF document is viewed and/or printed.